"It's about the music. Period." ← News and Upcoming Shows! MORE DETAILS FOR UPCOMING SHOWS! First and foremost a few bits of news! We are pleased to announce the addition of two fantastic acts to our CD Release show at The 8×10 Club (10 E. Cross St. Bmore, MD 21230) on October 9th! 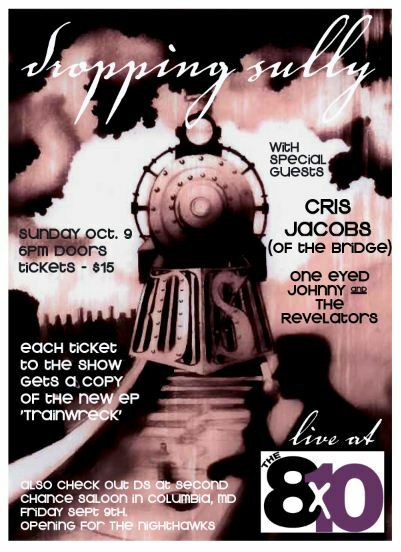 That evening we will be joined by CRIS JACOBS (of The Bridge) and One-Eyed Johnny and The Revelators. We are really excited and can’t wait to get on stage at our favorite venue in Baltimore. This is a show you shouldn’t miss. A lot of stuff in the works out here at DS HQ. We will be shooting the photo for the cover of ‘Trainwreck’ this weekend and will be releasing our single ‘Shine’ to you wonderful people in the very near future! In the meantime, be excellent to each other! Please give us your email and we will send you a link to download a tune from our forthcoming live EP. (We don’t like spam either so we won’t send you any). Main Street Music Fest and Dropping Sully Return to Ellicott City!